This stunning double bed boasts all the design hallmarks of our Shay collection, as well as high quality construction, helping to bring you your best night's sleep yet. 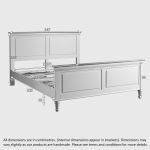 The whole bed frame is made from solid hardwood for excellent strength and durability, even the slats! Carefully kiln-dried, they provide a supportive surface for your mattress that won't warp or bow over time. 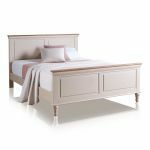 This gorgeous double bed is painted in a delightful shade of almond grey, which perfectly complements the rustic solid oak tops to the head and footboards. 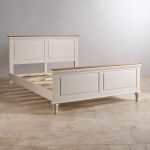 The legs are elegantly turned, and the top has delicate cornices for classic simplicity. Match your new Shay bed with pieces from our Shay bedroom range, and don't forget to browse our fantastic range of double mattresses for the ultimate in sleep comfort!